Lori from The Finished Project is a design and DIY-enthusiast, sharing her latest woodworking projects and home décor on her blog. 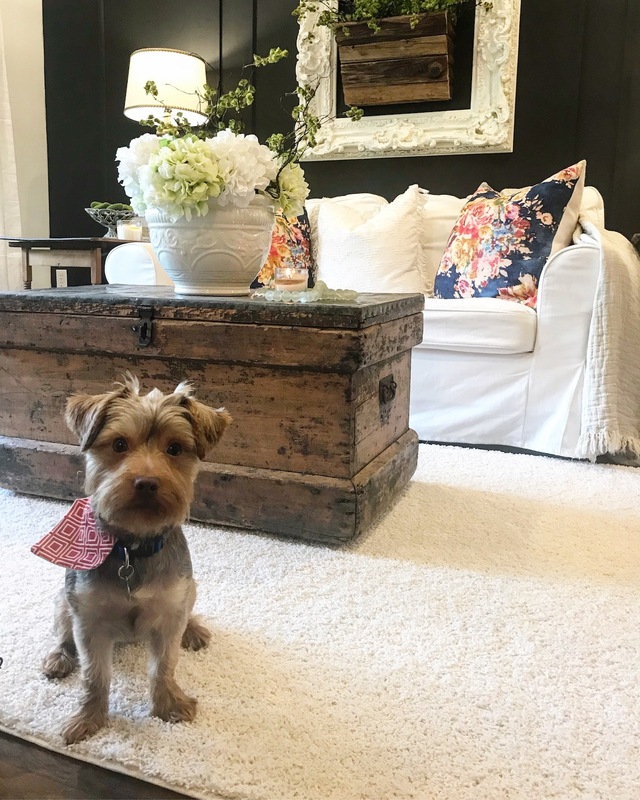 Here, she shares how a custom SmartStrand carpet-bound rug made her sitting room the perfect spot to unwind with her adorable pup, Ted. Hey, friends! We recently made an update to our sitting room, and I am so excited to share it with you! Many of you know how obsessed I can be with rugs. Well, I was thrilled to be given my choice of Mohawk carpet cut and bound into a custom rug! All the RevWood laminated wood flooring in our home is made by Mohawk, and we could go on and on about the quality and how much we love them. Therefore, I was so ready to try out their SmartStrand carpet in a bound rug — especially because it’s so pet-friendly! Being a home blogger and an Instagrammer, our home décor and style is important to me. I enjoy creating an inspiring stylish home, but also one that is comfortable and livable for both humans and pets. I try and provide a relaxed environment so that when my family or guests come over, there isn’t stress about spills and messes. I want it to feel warm and welcoming. Keeping that in mind, choosing the right area rug for your home can be a tough decision when you have pets. When I began to research Mohawk’s SmartStrand Forever Clean carpet, I was intrigued because it has a lot of features perfect for pet owners. Mohawk uses Nanoloc technology, which basically means there is built-in stain and soil protection on the carpet that won’t wear or wash off over time. That means my new SmartStrand carpet-bound rug has a spill and soil shield for easy and quick cleanup for when that mess actually happens. “With SmartStrand Forever Clean, pet accidents will not absorb into the fiber. This added protection reduces common pet-related odors.” With two boys running around and a dog, life is messy, but Mama still wants style. When style meets functionality, that is a win-win for me. In our sitting room, we have a dark, moody feature wall. To balance out this space, I envisioned a soft and light-colored area rug. That is a scary choice to some. A white rug…hmmm, but paired with Mohawk’s SmartStrand technology, there is nothing to fear! Because we have dark wood flooring, I envisioned the contrast between the dark floors and a light and airy rug balancing each other out in an eye-pleasing way. The carpet we chose for the rug is a low pile textured shag that offers warmth to the room in the perfect blend of a soft off white. Everyone seems to love the softness of this rug as well. Our dog, Ted, has found a new place to relax and spend time with his loved ones and of course, his favorite toys. Our family loves to kick off our shoes and lounge in this space now; it feels so welcoming and cozy. We have coffee, read books, play with Ted, and simply enjoy the warmth of the space together. We are very pleased with our new SmartStrand carpet-bound rug and would highly recommend it. If you’re looking to create your own stylish carpet-bound rug, SmartStrand comes in many colors and styles. From a cool shade of gray to a lovely shade of cream, and patterned to textured, your options are endless. Explore SmartStrand to find the perfect match for your home!